With the booming popularity of RPGs ("JRPGs") through the years, its often fun -- and depending who you ask, "important" -- to go back to yesteryear, and see just exactly how we got to where we are today. With Dragon Quest X right around the corner, now might be as good a time as any to check your roots, and see how it used to be..before so much of what we take for granted today was around. The first game in the Dragon Quest / Dragon Warrior series is, of course, Dragon Warrior, a game that most children of the 80's knew about due to it being awarded as a free gift by subscribing to Nintendo Power. 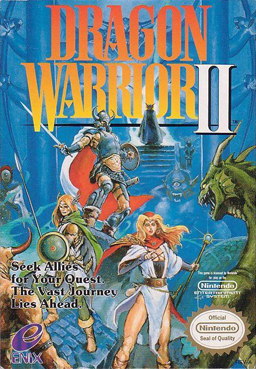 A game that WASN'T given away by the truckload was Dragon Warrior II, a title that improved on many of the flaws of the first installment. While not receiving as much attention on the NES console as Dragon Warrior III or Dragon Warrior IV, it did play an instrumental role in pointing that ship in the right direction, coordinates set to "awesome." Set 100 years after Dragon Warrior, a Hero in the line of Erdrick (who is known as "Loto" in some versions of the game) sets out on a journey to rid the world of Hargon and his minions, a foul creature who never sleeps, and has disrupted a century of peace. Boo! For anyone who can't take Dragon Warrior for the mind-numbing monotony of one-on-one battles..this game may provide enough spice to fix that up for you. Whereas the first game was "you vs. The World," this game allows you to recruit companions (mandatory). The first party-based game in the series, you'll lean on the Prince of Cannock and the Princess of Moonbrooke to aid you in your journey. 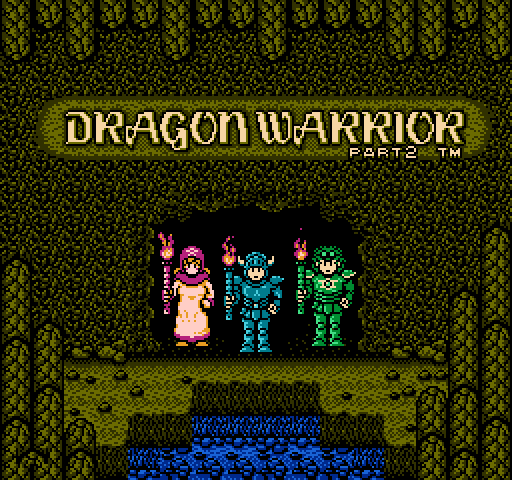 Dragon Warrior had you play as a warrior-type character, able to equip lots of swords, shields, helmets, and heavy armor, learning few spells along the way. Dragon Warrior II splits up those duties; the Hero gets to carry the powerful equipment, the heavy-hitting soldier of the group, the Prince does lighter armor but boasts some magical abilities, and the Princess is quite close to the mage-type character so commonplace now, heavy in magic and light on hand-to-hand combat. You might be thinking "hey, three-on-one doesn't seem so fair," but this has changed as well. In Dragon Warrior where every-single-battle was a one-on-one affair, you now find yourself fighting three enemies on a regular basis, and depending on which types of enemies they are, it can be plenty more (ie: those Metal Slimes are back, and sometimes there are 8 of them. Think of the experience.. ). More enemies per battle means more experience points, which means you level up faster, walk around less, and finish quicker. Solid. And because of the diverse run of bad guys, you'll have to employ a bit of strategy here and there, another break from the autopilot of "fight, fight, fight." This game features a lot more weapons, armors, and spells than the previous game, and allows you to hold much more equipment as well, each character having their own items. One of those new Items is a Ship (though it doesn't go in your Inventory)! The Ship, which you get in the first half of the game, really opens things up and allows you to explore a much larger world, and get from place to place quicker instead of pacing around on foot through the entire continent. Speaking of that continent from Dragon Warrior (and somewhat of a spoiler, sorry), it has RETURNED (though scaled down a bit) and is accessible in Dragon Warrior II. Nearly unchanged (in both sight and sound) from the first game, you can set foot in Tantegel Castle, and get a Critical Nostalgia Hit square in your face. Really cool, and I wish more games did this. You're also able to find the same armor you -- as a player -- wore in the first game, gathering the same Erdrick's Armor set that your ancestor donned 100 years ago. Lastly (though you'll notice it first), the game is prettier. More vibrant colors, more variation in both party members and NPCs designs, more tones in the enemies palettes, among other things, and a definite jump from the original game will be detected quite early. There is a wider variety of music, also, and unlike Dragon Warrior, it isn't as depressing this time around. Happy day! While the addition of two new characters sounds awesome, it isn't always. You'll find very quickly that there isn't a whole heckuva lot of stuff you can equip on these other characters, and as the game wears on, you'll find those other characters somewhat underpowered, and definitely taking a backseat to the damage your Hero character is dealing..so much so, that its almost like the backseat of another car, two cars back. They do make up for the lack of physical offense with some powerful Magic, but MP doesn't last forever. In fact, the only way to restore magic points besides sleeping is with a Wizard's Ring, an item -- to my knowledge -- that can't be found or purchased, but only WON in a chance game of Lottery, or apparently on a random drop from a difficult monster late in the game. I could've used it dearly throughout my gameplay, but sadly never came across it. Bummer. The previous paragraph covers the offense of your buddies, and the defensive situation is even more dire. You're pretty much hosed here; the Hero is fine, but the Prince's best equipment choice is the same as the Princess', a cloak made from two hard to find materials. There can only be one (unless you glitch the game), and your unit without the cloak is not going to have a good time. The best option (after you get the cloak on the Prince, probably) is to purchase the most expensive armor in the game, priced at the sum of 65,000 gold (you stop collecting gold at 65,600 or something, Legend of Zelda style), a total that isn't reached lightly. And its not even that good, especially when compared to the armor you've got with good 'ol P1. While the ship is a good thing, and the larger world is a good thing, it also means that it takes a darn long time to get from place to place. Some games give you the option of warping to towns you've already been to, but that is not the case here. You DO have the option of casting Return or using a Wing of Wyvern to go back to the town/area where you last Saved, but it isn't perfect. And without a special item, the only place you can save is in a Castle, with a King. You CANNOT save in every town, or in the field. Even if you DO have that item, there are so many other Items that are mandatory that you probably won't have a lot of room in your inventory. Yes, the inventory is expanded, but you're forced to carry three types of keys, a flute, some other late-game special items that you MUST carry, and this is all ON TOP of your equipment. Lucky this is cleaned up in most other RPGs after the fact, but putting your Sword, Armor, Helmet, Shield, and Accessory all in your pocket doesn't leave room for much more. At the end of the game, everything I was carrying was stuff I NEEDED to carry, and I didn't have any Herbs or Antidotes on me at all. On the topic of healing from your inventory (as opposed to a Heal/Healmore/Healall spell), you only have the ability to revive a character ONCE per outing. Unlike other games where you use a Fenix Down or something like that, this game uses the Leaf of the World Tree to bring a character back to 1 HP, and you may only carry ONE at a time. If you use one up, you get to take a boat back to this island, well out of the way to pick up another one. If you have to use one in a dungeon area, hold your breath and hope for the best. Later on you do gain access to a Revive spell, but only one character has it, and it cannot be used in battle. I had to use one up before the midway point into my "final run" to beat the game, and it got pretty hairy throughout. I had to ask myself "do I turn back, or do I move forward?" I moved forward, and I made it to the end. And actually, kinda weird here, I thought the final battle was "too easy" (especially in comparison to the hard as balls Dragonlord fight in Dragon Warrior). After losing here and there and everywhere prior, I got to the last guy and just wailed away on him, even after losing the Princess. He fell with relative ease, so much so that I let out a muted-yet-excitable-and-audible "oh?," and scrambled to turn up the TV for some sweet game ending music..
..but before you get there, you've got the "second half of the game." After the ship, the game opens up..but not in a good way. The freedom the game provides you is at the expense of direction. Once I grabbed the ship, I sailed around looking for something to do (I found Tantegel, cool), but got an "alright, what do I do?" feeling very quick. There is an area where you are supposed to look for "Treasure," by directions given to you, and it's apparently very touchy. I tried diving and diving at this disturbance in the water for treasure to no avail. I tried from all angles, all sides, all directions, and nothing worked. I grabbed an issue of Nintendo Power that I had acquired a week prior by chance, and one of the things in there was "Where is the Treasure?" It told me to look EXACTLY where I was looking, and within the next few attempts it told me I found some treasure. Bad hit detection or something? I'm not entirely sure what happened there..
Hand-in-hand with that type of stuff, the second half of the game basically begs you to use a walkthrough. Priding myself as an experienced player, I tried to do the entire game without any outside help whatsoever. I did occasionally check a map online as they would've been included with the game way back when, so I found that ok. When the second half came, and I had no idea what to do and no new information, I had to take a peek. Exchanging that Treasure with someone in a town, you are given an "Echoing Flute," an item that you're supposed to play and it will resonate if there is a Crest nearby (you must collect all of them to get a special Item -- thankfully, these Crests are stored somewhere other than your inventory). The thing is, with few exceptions, you probably wouldn't naturally come across these Crests, and that goes for a lot of things in this game. I don't think this is me being a complainer or a whiner or whatever, but why in the world would you randomly search a tile in a random part of the world, repeatedly? There is nothing to clue you in to where something MIGHT be hidden, but just that it was placed there magically by the programming gods. Once you get to the end of the game and you've got everything on you, chances are you're going to grind...for a while. I arrived at my Shrine before Hargon's Castle (nice that they put it there) around Level 24, and I disembarked around Level 33. My last few sessions were for the sole purpose of fighting, getting experience, and saving (every two fights or so). These guys that you're fighting though are -tough- , and sometimes pretty cheap. There are these guys, Gold Batboons that you fight in swarms of three, and sometimes there is NOTHING you can do about them. On numerous occasions I was fighting at usual, and they'd decide to cast Sacrafice. If they do this, your entire party dies, and you watch it happen, without warning or any defense. There is something very bothersome with the idea of a "footsoldier" having the ability to wipe out your world-traveling, monster-slaying warriors in one move. Again, this isn't a boss, but an enemy that you'll meet numerous times through the final portion of the game. And lastly, again, while you have those extra players and more stuff to do, you'll find yourself doing the same things over and over again in each fight: Attack with the Hero, Attack / Use a Shield to Heal with the Prince, Cast Mass Magic spell with the Princess. I suppose this isn't very different from a lot of other games, but still somewhat frustrating. There is a Thunder Wand that the Princess can equip, and you can use it as an Item as well, casting a lightning attack on enemies, doing about 25-30 damage on average. Towards the end of the game when guys routinely have 100-170 hit points, this isn't going to do nearly enough. You'll rely on your Hero to do the work while the rest of the party watches, and struggles to keep up. It sounds like I'm really dogging this game in some parts (as my What It Doesn't Do Well section is larger than the first, haha), but I had a good time with it, especially early on. It was fun to feel accomplished recruiting the Prince and then the Princess, opening things up and being able to buy more equipment and such. I with that the other members were able to be competitive physically, something that I KNOW is possible because it exists in so many other games throughout history. Again, this is a game from 1990, and just the second in a series of "going on ten," and it did take a nice big step up from Dragon Warrior. Should you give it a shot? Eh.. yeah, sure! It's not THAT bad of a game, and it'll definitely make you appreciate how far we've come since then. If you played and liked Dragon Warrior, I do think you'll like Dragon Warrior II a lot better. If you live in Japan (of COURSE you do!!) and have access to the Dragon Quest Collection (if/when it comes out), do it to it. If you're interested, and have your NES and eBay, track this puppy down. I got II, III, and IV in the same week I think it ran me about 70 bucks. You shouldn't pay too much for Dragon Warrior II; the expensive ones (especially if you're looking for a "complete" set with box) are Dragon Warrior III and IV. Look for a barebones bundle, the internet will help you out with Maps and Monster Charts. Thanks for reading, friends; it was a long journey, but it has now ended. Hargon is defeated, and we can all rest together. This was a fantastic review. All thanks to Mustache who bit the nostalgia bullet for all of us. Dude, you should black out your spoilers. I'm getting ready to play this game and I didn't need to read that. Thanks dudes, glad you liked it. And yes, X-pert, PLEASE let me (and Davoid) know how you fair. I can't tell if you're joking.. I didn't really spoil anything, even the stuff I kinda called a spoiler. Also..this is a review of a game going on 25 years old.. (originally released in Japan in 1987). Lol no I was being serious. That would have been a cool surprise, but yeah it is an old game I guess. I bet most on this board haven't played it before though. I wonder what are the specific differences between the NES version and the GBC remake. DW on the GBC was a little easier because it made grinding less a, well, grind. I'd imagine it is fairly similar for 2. There was a lot of grinding in DQ on GBC I thought. I maxed out my character on experience. Not difficult though since the level cap is only lvl. 30. Well I didn't say there wasn't still a lot of grinding but I think it just went faster as experience plateaus were a little lower. I want that top picture in the review as my wallpaper. EDIT: done. Downloaded an emulator just for that. Great review, I think the fact that I don't play that many RPG's is because none of these games (or Final Fantasy for that matter) hit European shores. I think the first true Final Fantasy game we got was VII, Lame. maybe I should just go ahead and play them on Emulator as I can't even get legal copies for the hardware I have at home. Good review Stache! And congrats on finishing the game. Too bad you had to resort to a walkthrough, but such is the case with these old games that don't always have a clear direction on what you're supposed to do next. I was not one of those lucky individuals who obtained the first Dragon Warrior through Nintendo Power, but I eventually picked it up later on and finished it. It was a very enjoyable experience and really cool to see the beginning of the JRPG template. Since then I've sold my NES (*sob*) and never got around to playing any of the sequels, including this one. Based on your review, I would love to sit down and play this one through. It sounds like there were some big improvements made, and I would have greatly appreciated playing this one back in the day. Unfortunately I also missed out on the Dragon Warrior 1 & 2 collection for GBC, and I am hopeful for its release as a 3DS VC game. On a related note, I have the DS remake of Dragon Quest IV sitting on my shelf, waiting to be played! I think I said on the Finished Pile that I beat Dragon Warrior at Lv17. This game was something like Lv34. Yuck. Haha, you know EXACTLY what I sounded like then! That stinks. I'm sorry you don't get to experience RPGs as we do. I think..we kinda take them for granted as there are "so many," but if you're sparingly getting them here and there, man, I don't know how I'd do that. Even knowing that Chrono Trigger didn't hit Australia in cartridge is super-rough. What games showed up on the VC for you? I think the original Dragon Warrior is there (or is it not? ), but both Final Fantasy II and Final Fantasy III are there ("IV" and "VI"..) for us (you, too? ), and those games are solid. Final Fantasy III is a beast; crushes VII in my book. Thanks, brother. I knowwww, I didn't want to have to do it. You really don't know what its like though until you do it yourself. Such a pain! And without pack-in maps, you're sunk. There is no world map inset in the bottom right hand corner, or something like that, so when you're out on the open sea, its an actual "sea of blue," and you can't tell how far you're advancing, or how quick you're getting there. If you happened to line it up JUST RIGHT, its possible to sail around the ENTIRE WORLD without seeing ANY land. No good, sir. I had no problem whatsoever with the first half of the game. I walked here and there knowing thats where I had to go, and I did some exploration prior, but once you get that Ship..UGH. I also didn't get Dragon Warrior through Nintendo Power, but it was one of the first games I bought when I started building my NES library many, many years ago. I used to only get games as presents, or with birthday money. When I got a little older (in my teens), I found the awesomeness of used game stores. When I was younger, I actually didn't KNOW you could just buy any game you wanted; I thought that the rental places had the inside track on stuff and thats the only place you could play those. I kinda..got confused one day when I went to a buddy's house and he OWNED Mega Man 2. How....can this be? 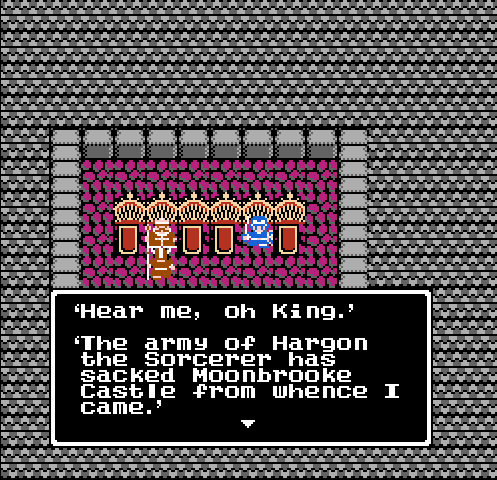 Oh man, play through Dragon Quest IV as Jargon and I play Dragon Warrior IV. We gotta mow through III first though! Wow, that's quite an in-depth review. I'm going to have to disagree with it, though. Like the original Dragon Warrior/Quest, there's just way too much grinding in the game, and not really anything interesting that happens in between. Dragon Warrior/Quest didn't get good until Dragon Warrior III, and didn't hit its stride until IV. I and II aren't worth playing today. For those who plan to try Dragon Warrior II anyway, here are two good tips for you. Get the Falcon Sword as soon as you can. This is by far the best weapon for the Hero. Don't be fooled by its low attack power: it attacks twice in one turn. Two attacks are always better than one. Also, once the Prince's strength stat is high enough, get him a Falcon Sword too. Right when you get the Staff of Thunder, there's a simple money-making trick with it. All you have to do is sell it for 19,500 gold, save the game and reset, then go back to where you got it and you can get another one. You can repeat this as many times as you like; as long as you don't have the Staff of Thunder in your inventory, it will appear. This is an easy way to get that 65,000 piece of equipment mentioned in the review. There's also a trick to get a second key item that doubles as good armour, but that involves spoilers. You figure it out. I would very much disagree with you about the first Dragon Quest game ( I haven't played the second one yet). I have it on GBC and found it very playable and enjoyable. Yeah it was pretty bare bones and there was a lot of grinding, but what was there was solid. No it doesn't stack up to games like Chrono Trigger or the epic fantasy RPGs we have today. But if you want to know where it all started, I would recommend the original DQ game to anyone who likes RPGs. Yeah, keep in mind what we were dealing with back then, like WrathOfSamus said. This is mid-late 80's stuff; Chrono Trigger is, what, 1995? A full 10 years later, and an entire system up? Dragon Warrior IV was one of the last games on the NES, released after the SNES was already out, and they kinda knew how to do RPGs by that point. Heck, Final Fantasy on NES isn't even THAT good, and pretty much in line with these other RPGs. Its still Final Fantasy, but it doesn't come close to Final Fantasy II, and DEFINITELY not Final Fantasy III. What other RPGs did we have on NES at that time? Ultima? Ultima WISHES it was Dragon Warrior. It was on Master System, but the only other relevant RPG series of the time that I know of that people really wax nostalgic about from that time period is Phantasy Star. Man, I'd take both Dragon Warrior and Dragon Warrior II over Phantasy Star II. Maybe I'll resume my VC file soon.. I didn't say it was bad back then, I said it isn't worth playing now. This isn't 1989, we have better games to play now and don't have to tolerate games that are too ambitious for the old technology on which they appear. That's just my view though: I didn't like videogames until the Nintendo 64 came out and the technology allowed for bigger, better games, so I'm certainly not what one would consider an "old-school" or "nostalgic" gamer. That said, I do understand the sentiment of trying a game due to its history, such as being the first of a series. I've done that before, whether or not I thought I'd like the game. However, in this case, that applies to Dragon Warrior; Dragon Warrior II can be skipped without missing out, in my opinion. I still don't think that's much of an argument though. We have better 2D platformers than the original Super Mario Bros. Does that make SMB not worth playing now? Of course not. It's a huge piece of gaming history, as is the original Dragon Quest. How about Legend of Zelda? A Link To The Past blows it away in every conceivable area and is regarded as maybe the best 2D game ever. Does that make the original Zelda not worth playing? Of course not. You just have to go into playing a very old game like that with realistic expectations. I went into the original DQ expecting something very old-school and probably pretty bare bones, and that's what I got. And I really enjoyed it.